In New York City, housing is at a premium with so many people living in such a relatively small area. Apartments prices are skyrocketing and the need for space has increased considerably over the past few decades. Given the cost of new apartment and residential buildings, making the most out of the available space has become a premium. This is where temporary walls or pressurized walls provide a solution for construction, apartment managers and residents, and house owners for providing more space at a low, affordable cost. 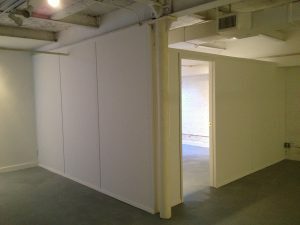 The temporary walls NYC apartment managers, residents, and some home owners are familiar with consists of building a wall inside an existing room without doing any damage to the floor, walls, or ceiling. The wall itself is solid and placed along the studs of the surrounding walls, but is pressurized so that it stays in place. Because the pressurization holds the wall in place, there are no nails, glue, or other products used to keep the wall in position. Plus, the pressurized walls NYC residents are familiar with cut down on the passage of sound just like permanent walls. And, they are seamless enough that many cannot tell that the wall itself is temporary. Once the need for the temporary wall has passed, it can be removed quickly and there will not be a trace of its existence left which protects the value of the property. The benefits for apartment and home owners is obvious as adding a new room means getting a new tenant which increases the income the property generates with relatively little expense and no damage caused to the property itself. In the construction industry, a temporary or pressurized wall offers considerable benefits in creating new rooms from larger ones that provides options in the construction or renovation of existing properties. For example, a home owner that wants to create two rooms from one normally faces the risk of lowering the property value. However, pressurized walls mean that a new room can be created without doing any damage and be removed if desired for a new owner of the home. The solutions that temporary walls provide are such that they offer those in the construction and renovation industries a powerful, desirable alternative when adding new rooms to apartment buildings, condos, and homes. Plus, there is a significant cost savings when using this type of wall which may remain in the building for many years. For those who are considering adding a room by dividing up a larger space, the practicalities of using a pressurized wall offers substantial benefits with no downside. The wall is real, it blocks out sound, and is strong and durable just like a permanent wall. For apartment and home owners, temporary walls NYC residents are very familiar with offer a way for tenants to add space for an additional renter which helps make the most out of providing income for their property. In construction, pressurized walls NYC businesses use provide additional options that can be changed based on needs without undue expenditures.